During a visit to England in spring 2013, we enjoyed many puddings and cakes garnished with little round golden/orange colored fruits framed by lighter gold husk-like leaves. They were slightly crunchy with a sweet and tart flavor, tropical like pineapple. I’d never seen or eaten them before and even their name, Cape Gooseberry, was unfamiliar. 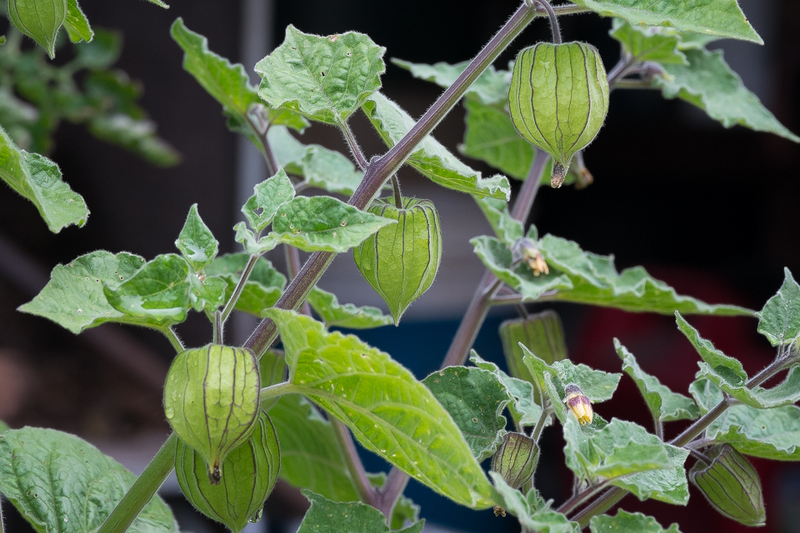 Months later as I was ordering seeds for the 2014 kitchen garden I saw them again, this time in the Territorial Seed catalog under the name Ground Cherry, Physalis peruviana. They were listed along with tomatillos, another husk-enclosed orb of the Physalis family. I definitely had to try growing some of these delicious little fruits. Of the two varieties offered, Aunt Molly’s and Pineapple, I chose Aunt Molly’s because the days to maturity were ten days shorter than for Pineapple. The catalog description suggested growing them as you would tomatoes, starting seeds indoors six to eight weeks before the last spring frost, carefully hardening them off before setting them out in a warm place, and watering regularly. When I told my friend Carol, a specialist in unusual plants, that I was growing ground cherries this year she offered me seeds of goldenberry, a related variety, to try as well. The tiny seeds of each variety germinated well though slowly, and by late spring I had sturdy plants to set out. I put two of each variety in the cold frame where they’d get plenty of heat and good irrigation, spacing them about eighteen inches apart. In the weeks that followed their growth habits emerged. The ground cherry sent out branches in all directions, hugging the ground as its name suggested. The goldenberry grew upward, strong branches more like those of tomatillos. Both produced lovely exotic blossoms, yellow with purple centers. If they’d done nothing else, they’d still have been a great ornamental addition to the kitchen garden, but by mid-July the blossoms gave way to little lantern-like shapes hanging from the branches, lovely as well. The ground cherry lanterns were light green and rounded while the goldenberry lanterns were darker green veined with purple and elongated. And finally, just as the catalog described, the husks on the ground cherry turned from green to golden tan and dropped to the ground. I gathered a handful, peeled back the husks and there were the golden/orange orbs I’d tasted over a year ago on English desserts. We ate them like candy. The cold frame became the favorite kitchen garden snack stop. We’ve continued to treat them like candy but the abundance of ground cherries has lead me to look for other ways to prepare them. They are definitely more than a dessert garnish. In her cookbook Chez Panisse Fruit (2002), Alice Waters suggests holding them by the husk and dipping them in chocolate for a stand-alone dessert treat. Moving beyond desserts, she suggests adding them to salsas and to salads. Their sweet/tart flavor combines well with spicy peppers, pickled onions and sweet tomatoes as well as with pungent greens like arugula. 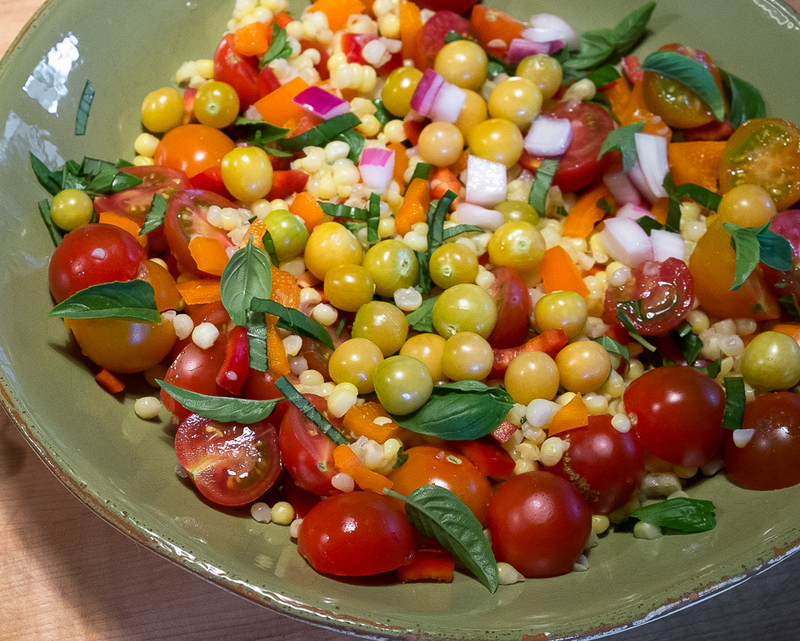 Recently I made a salad of fresh corn, cherry tomatoes, lightly pickled red onion, basil and lots of husked ground cherries. The ground cherries added a welcome layer of sweet tart flavor to this already tasty mix. 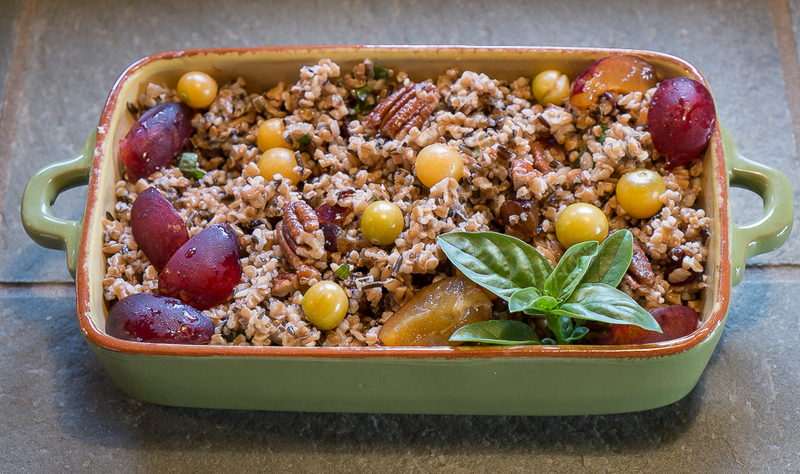 To a grain salad made with Bluebird Grain Farms Potlach Pilaf (cracked emmer farro and wild rice), I added sliced fresh plums and basil leaves, toasted pecans, and lots of ground cherries to the cooked and cooled grains for a delicious complement to pork chops. 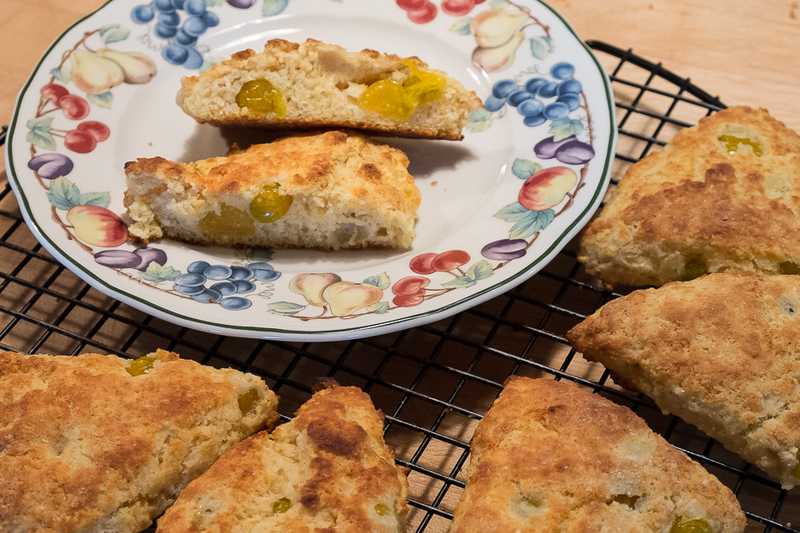 And one morning, I added husked ground cherries to cornmeal scones, just to see what they’d be like. Cooked, they lose some of their intense flavor and reminded us most of blueberries. They were tasty but their flavor raw is so much more interesting I think I’ll stick with them fresh and experiment with more salsas and salads. 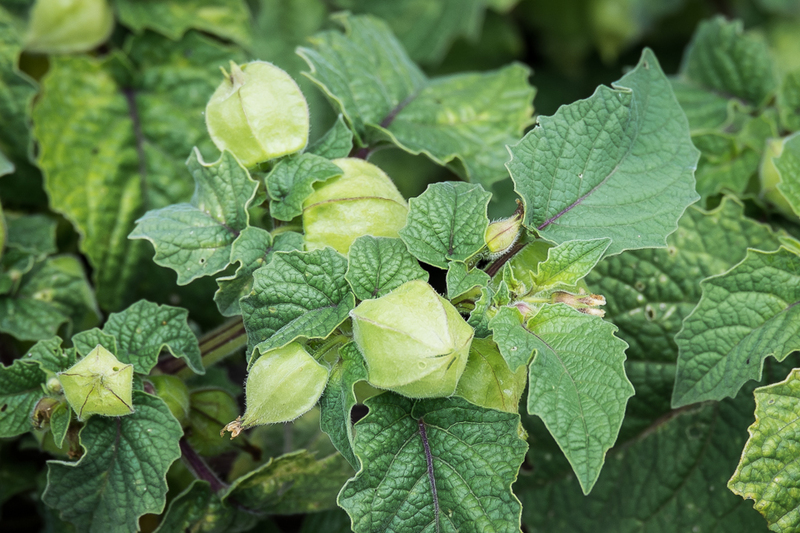 Waters also points out that ground cherries “continue to color and ripen after harvesting and should not be eaten until they have turned yellow or orange.” (52) Other sources explain that when green and unripe, ground cherries can cause an upset stomach. Finally, in good news for storage, Waters and others say that ground cherries in their husks will keep for months in a cool, dry place. Google searches have turned up many more dessert and salad recipes for ground cherries as well as more tips for growing and harvesting them and even lists of other names they go by: husk cherry, Peruvian ground cherry, bladder cherry, husk tomato, strawberry tomato, pohas or poha berries. I’ll continue to collect recipe ideas as the remaining ground cherries ripen. In another month the goldenberries should be ripe too and will provide more material for experiments. Thanks to those English desserts, ground cherries and their cousin goldenberry will be part of our kitchen garden from now on.